I’ve had blow-dry lessons from some of the best hairdressers in this country – Yes, Ben Cooke (creator of Victoria Beckham’s various ‘do’s over the years) I’m looking at you, and, it has to be said that I remain a cack handed muppet at it. The problems are that I have short arms and a lot – and I do mean a lot – of wavy hair. So, the traditional hairdryer and brush method is backbreaking, not to mention, heartbreaking work with my thatch of frizzy fuzz. Years ago, I had a Remington Airstyler that was basically a hairbrush with a built in hairdryer, and, I have to say, I loved it. My only real problem with it was that the hairdryer was a rather feeble 300 watts, so drying my hair (which was a lot curlier back then) took hours. Luckily for me, the new 5in1 Remington Airstyler is a massive 1200 watts so this solves that particular problem, and has made me a very happy chappy blogger. 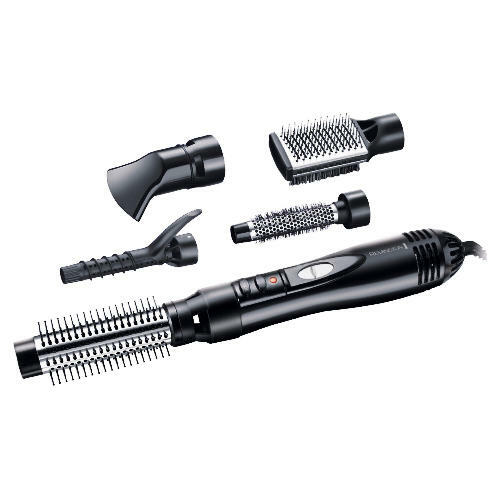 The new Remington Airstyler comes with five attachments: two round bristle brushes (one with hard “fixed” bristles, and one with softer, flexible bristles), a targeted hairdryer nozzle, a ridge “tong” attachment, and my own personal favourite, the flat “paddle” brush attachment, which has a side each of fixed and flexible bristles. I’ve found that I can give myself a nice (not great – I’m still rubbish), blowdry with lots of volume using the paddle brush attachment, in about 15 minutes or so, without really needing to follow up with my straighteners, or needing a massage on my aching shoulders – the fixed bristles glide through the hair smoothly with no snagging, and the flexible bristles provide a great deal of traction, which is great for making the hair smoother. The dryer itself has three speeds: low heat, high heat and a cool shot, which is very handy. All in all, a winner for me – and for around £25 it’s a bargain, I paid nearly £40 for one with just a quarter of the drying power (and no attachments besides the round brush and the nozzle) around ten years ago! My Mum loves these things and has an old Braun one (I think). I may have to get her one of these for her birthday, it might speed her up in the morning as the normal drying power is a little puny! I love that paddle brush attachment. Even I might manage styling with something like that.